I live in inner city Brisbane, in a suburb that I call Teneriffe. Most of the other people who live here call it Teneriffe too. In fact, it has been called Teneriffe for about a hundred years, give or take. Why am I mentioning this? Well, Australia Post, in its postcode wisdom, doesn't recognise Teneriffe. It wants us to call our suburb Newstead or New Farm, according to whichever side of an arbritary boundary we might happen to live on. Confused? You ought to live here! For a while, some magazines that I subscribe to were being sent to Tenerife in Spain (true story!) - but I digress. Anyway, there is currently a groundswell of support at the local political levels to restore the original name, and hooray for that, I say. As it happens, I live on the site of what was once the Teneriffe Wharves. Teneriffe used to be an industrial area, notable for the wool stores that were built here so that Australia's most famous export could be transported overseas by ship from the Teneriffe Wharves. The area that I live in is the Teneriffe Wharf Complex, and the apartment blocks that now replace the wharves all bear the various names of the old wool stores. 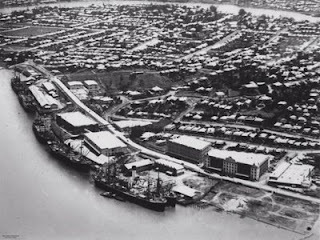 Recently I became aware of a huge archive of old photographs of Brisbane, including some of Teneriffe and its wool stores, that were being kept by The State Library of Queensland and the John Oxley library. These photographs are accessible online, and most of them are free of any copyright restrictions. Wouldn't it be fun, I asked myself, if I took photographs today of the places that are in these old images so that people could see how Brisbane had changed over the years? Indeed yes, I answered myself (bear with me - I'm alone a lot!) and so I have started to do exactly that, commencing with Teneriffe and some of the nearby areas including the city centre; and I will broaden horizons from there. There is a lot to look at in this photo (click on it to see a larger image). Firstly, the aerial viewpoint shows the way the Brisbane River bends around the New Farm - Teneriffe area on its way down from the city of Brisbane, which would be just outside the top right corner of this photograph, towards its mouth at Moreton Bay. This makes the area somewhat of a peninsula. Then you might notice the five quite large ships that are berthed at the wharves. Then, behind the wharves, there is a group of large buildings, some of which are wool stores. The last building, at the bottom right of the picture, is a cannery, as we will discover later. Now let's look at a current photo of the area. Too cheap to hire a helicopter for this purpose ;-) , I have had to make do with a photo taken from across the river at Bulimba. No ships visible here, and no wharves either. New apartment buildings have been built along the western bank of the Brisbane River, and the remaining wool stores have been converted to high-density living too.Wouldn't you think that Australia Post would give all of those people their own suburb name? Next: A closer look at wool stores. A great start Trevor. I am going to enjoy this. Once you have got a few posts up, I'll do a Brisbane food special and link to it! Just dropping by to say I love the idea of your blog and will read it with interest! Thanks a lot, Janet. If it is only a fraction as interesting as "The Old Foodie", I will be very happy. Thanks so much for taking the time to comment. I have only had time for a quick look at your blog just yet, but I will be returning to check it out properly.